JOHN 6:38 KJV "For I came down from heaven, not to do mine own will, but the will of him that sent me." 35And Jesus said unto them, I am the bread of life: he that cometh to me shall never hunger; and he that believeth on me shall never thirst. 36But I said unto you, That ye also have seen me, and believe not. 37All that the Father giveth me shall come to me; and him that cometh to me I will in no wise cast out. 38For I came down from heaven, not to do mine own will, but the will of him that sent me. 39And this is the Father's will which hath sent me, that of all which he hath given me I should lose nothing, but should raise it up again at the last day. 40And this is the will of him that sent me, that every one which seeth the Son, and believeth on him, may have everlasting life: and I will raise him up at the last day. 41The Jews then murmured at him, because he said, I am the bread which came down from heaven. For I came downe from heauen, not to doe mine owne will, but the will of him that sent me. For I am come down from heaven, not to do mine own will, but the will of him that sent me. For I have come down from heaven, not to do my pleasure, but the pleasure of him who sent me. For I am come down from heaven, not that I should do *my* will, but the will of him that has sent me. For I came down from heaven, not to do my own will, but the will of him that sent me. For I have left Heaven and have come down to earth not to seek my own pleasure, but to do the will of Him who sent me. For Y cam doun fro heuene, not that Y do my wille, but the wille of hym that sente me. 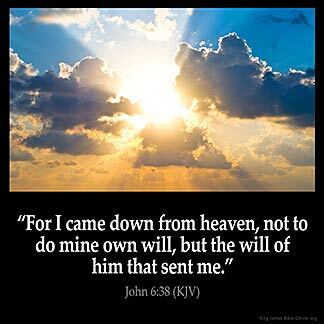 Joh 6:38 For I came down from heaven, not to do mine own will. Christ will refuse none who come to him; all such are given by the Father and he came to do the Father's will. I am forever grateful that Jesus came to do the will of our Father : It is not an easy thing to do : to change your will to do the will of God. Submission is always a thing you do not want to do. If it was : we all would be doing it all the time. It takes believing that what God says to do is the best , not only for you , but for others you are around every day of your life.